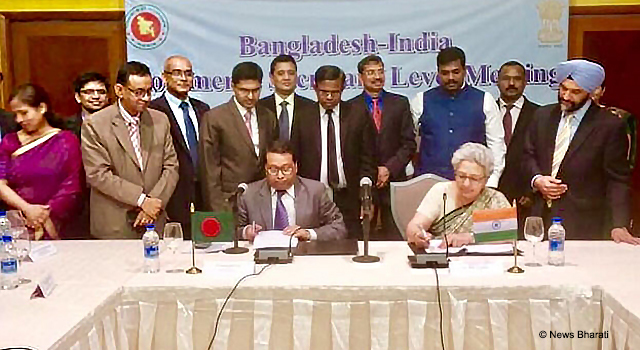 Bangladesh and India held a Commerce Secretary-level meeting on 7-8 February 2018 in Dhaka, Bangladesh. The meeting was led by Mr. Shubhashish Bose, Secretary, Ministry of Commerce, Government of Bangladesh, and Ms. Rita Teaotia, Secretary, Ministry of Commerce, Government of India. The discussions focused on issues concerning bilateral trade and economic relations, which including infrastructure upgrading at border trading points; expansion of border haats (markets); identification and resolution of non-tariff issues affecting bilateral trade; regional connectivity under the Bangladesh-Bhutan-India-Nepal (BBIN) Motor Vehicle Agreement; and ease of investment. 1. The Bangladesh and India delegations concurred on infrastructure and facilities upgrade for land customs ports along their shared borders. They reaffirmed continued commitment to efficient offloading of goods. 2. They agreed in principle to establish more border haats. Commending the performance of the four existing border haats, the Bangladesh and India delegations agreed to fast-track the procedure to set up six more border haats in the next six months. 3. Bangladesh noted that the proposal to allow more exportable items from India to Bangladesh's land customs ports is being studied. 4. India requested for duty-free facilities for its sugar exports to Bangladesh. 5. Bangladesh requested to access India's airports for third country trade, and a proposed to access India's Kolkata port to conduct export and import activities. Bangladesh hopes that this move will further attract Indian foreign direct investment in designated special economic zones on the West Bengal border. 6. Bangladesh thanked India for granting recognition of certificates issued by the Bangladesh Standards and Testing Institute for 21 food items, and followed up on their request for recognition of certificates for six remaining items.